For those visiting Bridgeport who have already sampled the city's fare or those who are residents of the city and beyond looking for a trip for a new culinary experience, here's a recent edition of WDTV's Tasty. This restaurant is not yet a year old and puts an authentic style on a staple in the area. And, it's just minutes away in Clarksburg off of Route 50. 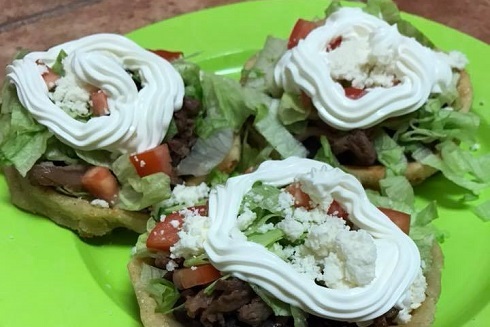 A relatively new Mexican restaurant in Clarksburg is bringing you, what the owners call it, "off the truck" food. "The whole theme of the restaurant was off the truck," said Lindsey Fonseca of Taqueria Lou Lou. Like many restaurants, there's a special story behind it. For Lindsey and Federico Fonseca, it started about three hours away from Clarksburg in Punxsutawney, Pa.
"He was a waiter in a Mexican restaurant and I came in and spoke a little bit of Spanish to begin with," Lindsey said. Lindsey was a customer and then she started working there as well. After some time, they ended up in the Clarksburg area. They were ready to either start a family or a business. They went the business route and Taqueria Lou Lou was born in Clarksburg. Editor's Note: Photos from the Taqueria Lou Lou Facebook page..